Toyota Nigeria Calls for Entry from Young Nigerian Children Between the Age of 8 and 15 for the Toyota Dream Car 13th Art Contest, See Theme, Contest Prizes and Application Guidelines for 2019. How will your dream car make the world a better place? Every year, thousands of children share their dreams with us. Join them and discover just how powerful dreaming can be. Remember, the National Contest is followed by the World Contest. The participants can win great prizes locally, get opportunity to visit Japan for an Award Ceremony. In addition, young dreamers are given tours at a Toyota factory and can experience various aspects of Japanese culture. 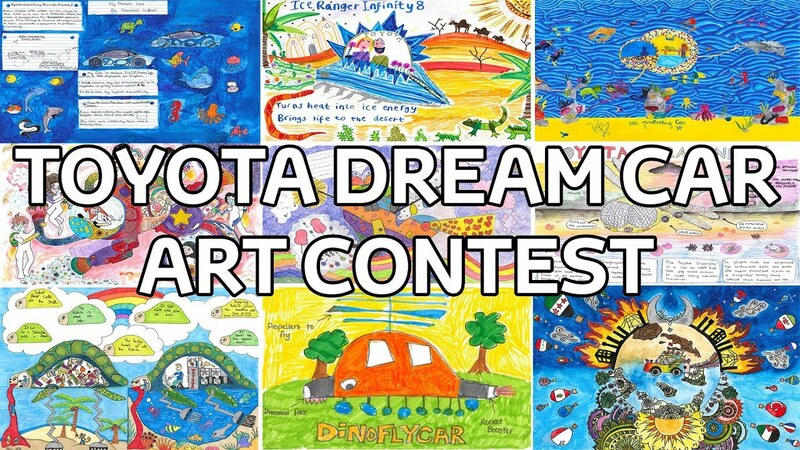 Toyota Dream Car Art Contest Details. Note: A participant must fall within but not above or plus the age category indicated on his/her entry form and birth certificate as at the day of drawing. The top 3 Artworks from each age category at the 13th Toyota Dream Car Art Contest (National Contest)” will be announced on www.toyotanigeria.com and a fabulous prize will be awarded to the winners. At the World Contest, an award certificate and extra prize will be presented to the gold, silver, and bronze award winners and they will be invited to the award ceremony to be held in Japan. Each Gold, Silver and Bronze winner gets an Invitation trip to attend the award presentation ceremony (scheduled to take place in August 2019). An award winner will be accompanied by one parent or legal guardian. Complete forms properly in CAPITAL LETTERS, and bring the completed form to the Drawing Centre for vetting on the assigned date for your locality. A passport photograph and A CLEAR photocopy of the birth certificate should be attached to the Entry Form. Each form MUST be endorsed by participants parents/legal guardians. Any drawing materials can be used, such as color pencils, markers, crayons, or paints. Collage or cutout pictures will be allowed for plane drawings, excluding ones making other artworks dirty or requiring special care in handling. Drawings that resemble the previous Toyota Dream Car Art Contest artworks, famous paintings, and that include trademarked characters. 1.) Abuja: International Community School, Abuja, Plot 75 Off Citec Road, Dakibiyu, Abuja. Date and Time: 26th January, 2019 Time: 8.00am. Date and Time: 2nd February, 2019 Time: 8.00am. Drawing Starts: 10.00am. Lateness is not permitted. Artworks entered are judged as the 13th Toyota Dream Car Art Contest (National contest). Top 3 excellent artworks are to be selected from each category. The top 3 places in each category in the 13th Toyota Dream Car Art Contest (National contest)” will be submitted to the World Contest that will be held in Japan. In the World Contest, these entries selected from each country and region will be judged by a jury panel, where award winners will be selected in order of the gold, silver, and bronze award, along with best finalists. Also, winners of World Contest cannot be awarded in the same category again. Fill in all the necessary items on the entry form, and securely attach it to the back of your artwork. Parent’s consent is needed to apply for the entry of this contest. “Application should be submitted at the at the drawing venues above”. Toyota (Nigeria) Limited will supply the drawing papers. You are to come with your choice artistic medium – (e.g. water paint, colour markers, crayons, etc.) Your artwork must not only illustrate a car, but must also include a background or setting. Artwork that bear striking semblance to artworks/ideas that won in the past will be disqualified.